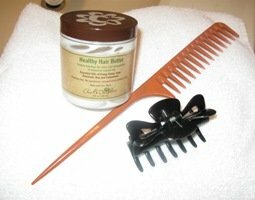 Before creating any braiding style, hair has to be prepped. So, how did I prepare my hair for this style? Step 1: With the skinny part of the rat-tail comb, I parted my hair in two sections, the back and the front. 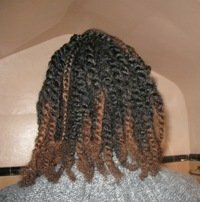 In the back section, I twisted my hair, using about 1/2 inch-1 inch parts for each twist. Step 2: In the front, I made 3 sections: the right, center and left. 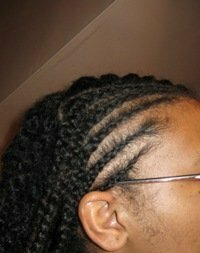 For the right section, I made 5 cornrow braids at a diagonal angle going toward my ear. See below. 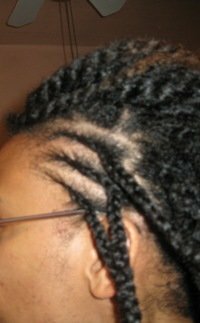 Step 3: Then for the left section, I made 3 cornrow braids at a diagonal angle toward my ear. 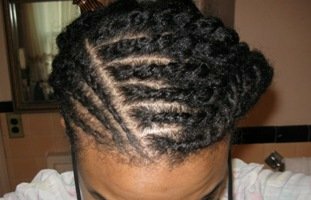 Step 4: In the center section, I made six two-strand cornrow twists straight across in rows.